NUTRITION, ENRICHMENT and SAFEGUARDING YOUR BIRD(s) are probably the three biggest concerns when it comes to the health of birds. 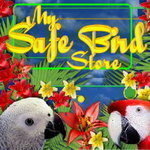 At mysafebirdstore.com, we do not take these three necessities lightly. Our site has been carefully constructed to provide you with SAFE products. ALL OF OUR PRODUCTS ARE STORED IN A TOTALLY BIRD-FREE ENVIRONMENT. · SAFEGUARDING YOUR BIRD is of utmost importance. Diseases are carried through feather dust and feces. Purchasing products which have been exposed to birds poses the risk of spreading an avian illness or disease to your birds. Illnesses or disease spread by feather dust and feces do not disappear or die on the delivery truck. Rather, they take the ride right to your door and into your bird’s cage. Buying from establishments where your products are exposed to birds that may be carrying diseases could be deadly. Some avian diseases can live upwards to 5 years in feather dust and can be carried into your home through bird products which have been exposed to birds. IF AN ESTABLISHMENT SELLS BIRDS, YOUR PRODUCTS COULD BE CONTAMINATED. · ENRICHMENT is so important to the mental health of your bird, thereby helping to eliminate unwanted behaviors. Little or no enrichment is one of the most common factors behind or related to behavioral issues. A bird’s mind must be kept busy at all times. Foraging is one of the greatest forms of enrichment you can provide to your bird. Safe products are likewise important when selecting toys and accessories for your bird. THE ONLY acceptable metals in your bird’s cage are stainless steel or nickel-plated. If you cannot determine the true identity of metals contained in toys, err on the side of caution and don’t buy it. At mysafebirdstore.com, we do the homework for you. Our toys are safe. There’s no need to worry about metal toxicity in a toy or lead or zinc poisoning as a result of the paint or finish used to color the toy when purchasing our toys. Simply put, we care about your bird. WE MAY NOT CARRY EVERY TOY AVAILABLE, BUT THE TOYS WE DO CARRY ARE SAFE. · Last, but certainly not least, is NUTRITION. A proper diet is necessary to maintain your bird’s good health. All diets must be supplemented with large quantities of fresh vegetables and fruits daily. All fresh foods should be removed after 2 hours. We have selected what we believe to be excellent sources of nutrition for your bird. WE HAVE CHOSEN TO LIMIT OUR SELECTION OF FOODS TO OFFER ONLY NUTRITIOUS PRODUCTS. By offering a large amount of products which are detrimental to your bird, we are defeating the purpose of our Mission. While browsing our site, please click on the pictures for more information. You can then place your cursor over the picture to better view the item. Please check back often as we continue to build our site with bird-safe, healthy products. Feel free to email us with any item you may need but which is not listed. We are here to answer any questions you may have. Please email us at orders@mysafebirdstore.com.